Kobalt air compressors are the house brand of the Lowes of big box store fame. Made for Lowes, the Kobalt line of air compressors is powered by electric motors and come in portable and fixed styles. The range of motors is from 1.5 HP up to 5 HP. These motors power a range of Kobalt compressors, small 3 gallon tanked units with a 1.5 HP motor up to the 5 HP vertical fixed style with an 80 gallon tank. We would categorize the Kobalt line of air compressors as mid-use. By this we mean that we would have no problem acquiring a Kobalt compressor for our home workshop or garage. We might even purchase a Kobalt compressor for our work, assuming that our use of compressed air was incremental, and not used continuously. If we were looking for a compressor to do work for us 8 hours a day, five days a week, we probably would not buy the Kobalt air compressors range. Here’s why. After sales service. Who Makes Kobalt Air Compressors ? Like all department stores or big box stores, the stores do not make their own house brand products. They outsource, and that source will change from time to time. At any point you might buy a Kobalt air compressor made by YY Company, and it may be possible to get the same model air compressor made by ZZ Company. Where do you get parts? Who do you talk to about service? Your air compressor will eventually break down. When, not if, it does, who looks after you? That’s why we would tend to steer clear of any big box store house brand air compressor if we needed one for production purposes. We would always go to an industrial compressor distributor, one that has the expertise and the parts to get us back up and running when the need occurred. Having said all that, for light use, no worries. 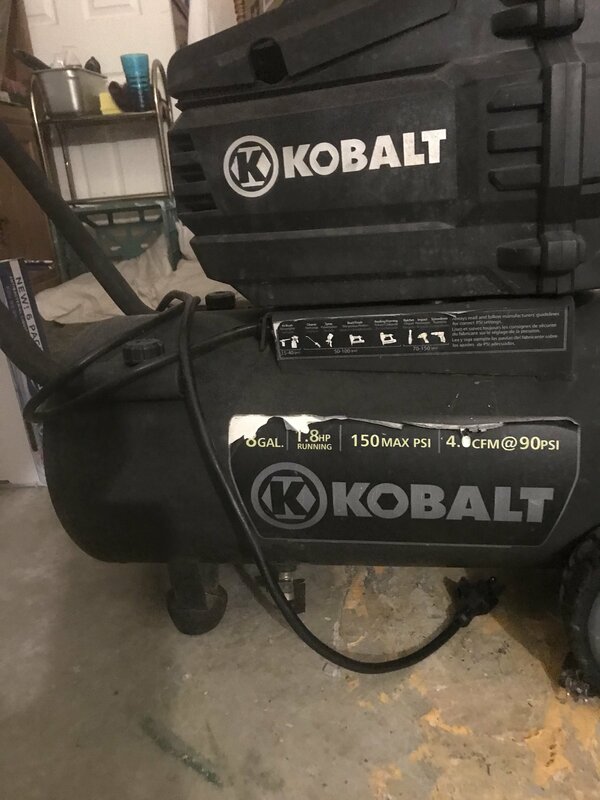 Buy the cheapest Kobalt air compressor that does the job – that means has the air flow you need for your air tools – and when it breaks, by and large you’ll toss it out and buy another. Do you have a Kobalt air compressor? Care to share your thoughts on them? If so, please provide the model number too so that others can read how you feel about your Kobalt. I have an air compressor model # 0300841. The manifold broke where I hook up an air hose to. I can’t find a part # for it. No part available.. then you’ll have to cannibalize a broken one, or make your own. See if there are any on the market that might be close to what you need. If not, get the fittings to make your own. They are available, and may actually save money over buying a new one, if you could find it. I need a manifold part # E101627…..all sites say discontinued. Is there a replacement part #? Where do I get this part!! So, what I think I’m seeing is a manifold from the compressor, on which is the two gauges and the regulator, yes? What compressor model is it, please? Without that information it’s pretty difficult to help. It’s an older machine cannot find book or anywhere on machine with model number it is manifold with guages a few if helps if not I keep looking thanks!! the model # for that 8 gallon horizontal compressor is 0300841 I also am looking for the manifold and so far have had no luck. Yeah, I see that. Even their catalogue parts list doesn’t show the manifold as a part. So, what’s with your manifold? What’s needed to fix it? I have a 1.8 hp 8gal kobalt. The check value started leaking constantly with every pressure up. Is there a way to fix the problem or do I have to replace the part? If this were my compressor, I wouldn’t try to run it on it’s side. Even though it’s user-added lube oil free, that doesn’t mean there is no lube inside. Also, if on it’s side, the tank drain will be in the wrong place. Sorry, but I don’t advise running it horizontally. I have a Kobalt Direct Drive Model 103798. When turning it on all you hear and get is a loud fast clicking noise. Was told it was the regulator. I changed that but no change. The electronic circuit board seems to work fine, all that is displayed is an upside down “U” on the display and the normal pictures. Thoughts? I’m not seeing too many air compressors (actually cannot find any) any more with digital regulators and controls. Reason being, in my opinion, they are prone to failure and very expensive to replace if you can find parts. This page may help: //fix-my-compressor.com/clicking-air-compressor/ . This one may too. Good luck. Well, a plug is cheap. Change the plug, and then use a multi-meter to follow the power to the compressor. With the tank empty, power should be crossing the pressure switch and flowing to the motor. If it’s not, where does the power stop? Calvin, I am happy to approve your post, however, must inform you that my website is not Kobalt, nor do I have any official affiliation with them. If you wish to critique Kobalt at the source, you will want to contact Lowes head office, as Kobalt is their house brand air compressor… among many other items. Good luck. I have a Kobalt 60 gallon compressor. It had been wired up and working fine for a couple of years. Then I moved. When I reworded it in the new shop it only runs for a while then the reset button on the motor trips. What can be causing this? 3.7 HP. 208-240 volt. I have it hooked to a 30 amp breaker. It’s about a 4′ run. Same exact setup from when I moved from the old shop. I brought it with me and tied into the new service panel. OK then, it’s not the power supply from the panel, Melvin. I still believe it to be because the motor is getting too hot and to me the next thing on the check list is the start capacitor. Please check yours, there’s a page about how on this site. That it may have failed when you moved the compressor may only be coincidence. Yes I read that about the capacitor. I’ll let you know the outcome. Thanks. I have a kobalt 8 gallon electric air compressor and after the tank filled up with air then as i was using it and the pressure went down the compressor kept sounding like the motor was gonna die and i maybe have only used this compressor around 5 times. Why would it sound like it’s gonna die on me while trying to fill back up with air? Very odd that, considering that it is necessary to purchase both the motor and pump as a single assembly. Current cost is $200+. If I was in this situation, I’d be buying a new compressor, one comparable one is around $170, quite a bit less than just the pump and motor. Good luck! I am searching for a check valve for a Kobalt air compressor(20 gal. 1.8hp) model #0332041. Pull the existing tank check valve, if you have not already done so. With it nearby, Google compressor tank check valves, and acquire one that looks the same as yours. As long as the new one fits in the tank thread, and the pump head line connects, and the line to the unloader connects if this model has one, you’re good to go. A weird noise might mean a gasket in the pump is letting go. When you say it’s still leaking, where is it leaking from? Hi Willyr, it’s still leaking when I put the old check valve back( air leaked under compressor switch,) the new check valve is good but have a weird noise. I ordered this check valve # CTRD 3812-PLUS. When you mean gasket which one( head gasket or gasket cylinder) and is that easy to do it? Thank you. If air is leaking from the bottom of the pressure switch, that’s an indication that the tank check valve is leaking. Depends on how handy you are. I cannot tell you if it’s easy or not for you. If you’ve taken things apart and put them back together successfully, and are creative in terms of making gaskets when you may not be able to find an OEM version, then away you go. It is my experience that pulling a compressor pump apart can damage the pump gaskets. Therefore, I recommend that you replace them all, ensuring that when the pump has been reassembled, that the process did not damage an older pump gasket. You are welcome. Good luck with the fix. I cannot advise you as to whether it’s better to fix or replace. Your skills and your wallet will tell you that. As to which is better, Husky or Kobalt, thought I don’t know for sure, I wouldn’t be surprised to learn they were made by the same factory. Best air capacity, best warranty, best potential for spare parts, best price… all criteria I use when I need to buy a compressor. 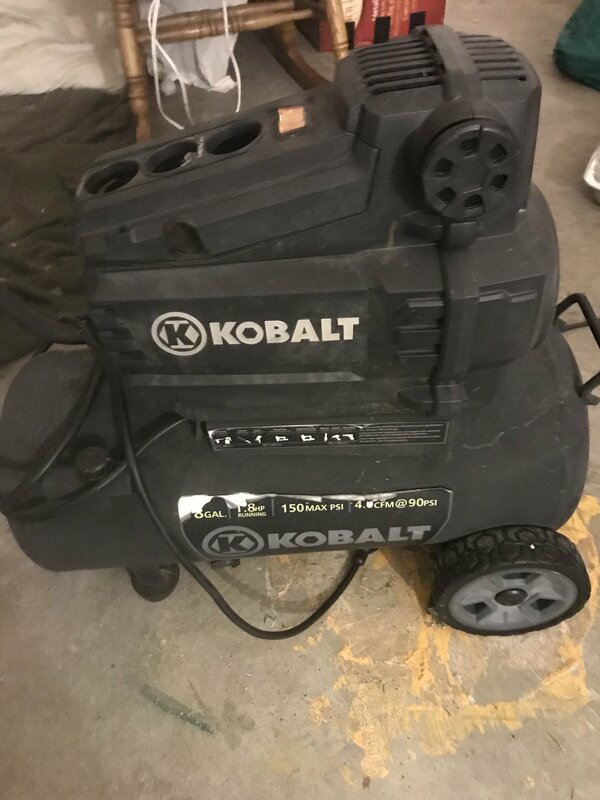 I have a kobalt 1.5hp 20gallon air compressor model number 03342041 i am looking for a regulator part number WCFATY.04.05, do you have any suggestions? Sorry, without a model number of the compressor, I cannot make any recommendation, as neither of the numbers you provided result in any information on line. Perhaps you might add a comment here with a photo of the regulator you want to acquire? I have a 60 gal Kobalt air compressor that is spitting a fine mist of oil out of the breather. I changed the oil and still appears to be happening. If by the breather you mean the air intake, that suggests that the intake valve on this Kobalt compressor has failed. A pump repair kit with valve plate and gaskets is in order. Ok I took the cover off and it is belt driven. It is the belt making the squealing noise, it has a flat spot on the ribbed belt. As far as why it was shutting down I don’t know, maybe getting too hot? Anyway, I need a replacement belt. If the belt was squealing, that would suggest that something was stopping the belt, while the pulley turned. Just a guess, but I think you’ll need more than a belt. I’d be looking at the cylinder / piston too just to see what’s what inside. Don’t know the model number so don’t know if this is belt driven. Is the smell a burning belt, or is it coming off the motor? What weird noises, please? I have Kobalt 80 gallon unit and its work great for about 5 years now ,but now I have to turn the switch on and off a dozen times to get it to turn on , I am worried it may not turn on at all dont know whats going here any one know ??? I have a Kobalt Model 37296 Air compessor and I need the start capacitor. But when I look around I only find them for 250 volt. the bad one I have is only 125 volt. Was this a special item for this compressor only? I am going nuts trying to find an unloader valve for a Kobalt 30 gallon air compressor with the model numbers 215921 (KLA1683066) on it. 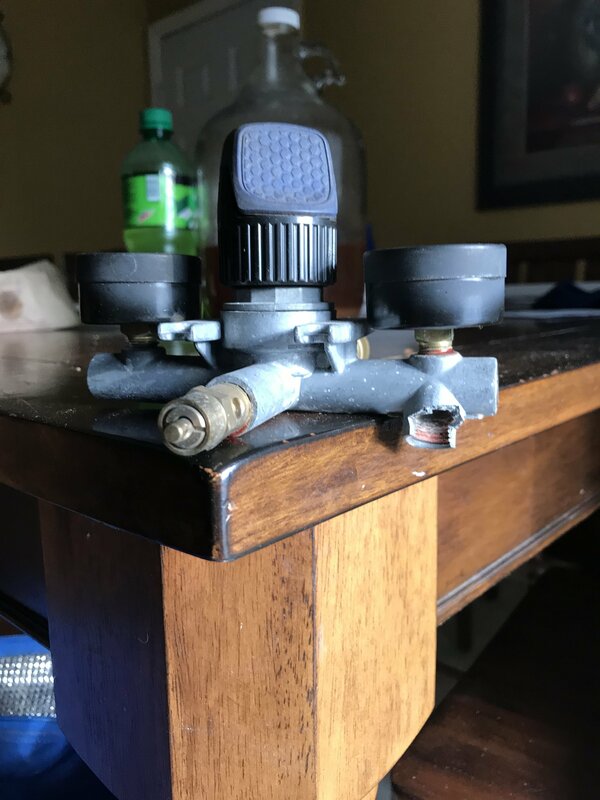 Campbell Hausfeld sent me a check valve instead and I can’t find what I need…. I am in Panama City Fl area, does anyone know where I can get help? @mitziHarless… have you looked here? I bought it 8 years ago for the past 5 and a half years I have been wanting to fix it but haven’t been able to till now. The metal around the piston fractured. How can I get a replacement? Model 37296. 26 gallon 159hp. It’s a 2008 model. It’s been sitting for 5yrs. Now I need one and can’t buy a new one. It is missing pieces of the metal shroud so welding is not an option. Thanks for any help.